The musical exploits of the Savall family quite justifiably receive high praise On An Overgrown Path. Two years ago I enthused over daughter Arianna Savall's CD Bella Terra, and that particular album has been a long term favourite on my iPod. So it is disappointing to give a thumbs-down to Arianna's newly released Peiwoh, despite its stellar line-up of musicians which includes Pedro Estevan and brother Ferran, whose gritty album Mireu el nostre mar was one of the highlights of last year's new releases. 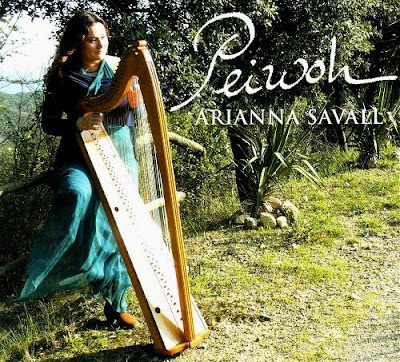 In the notes for Peiwoh Arianna Savall acknowledges the influence of the Canadian harpist and singer Loreena McKennitt, whose music I am not familiar with, although I understand she sells shed-loads of records. But having listened to some samples on Ms. McKennitt's website I have a fair idea where this album went wrong. There are some beautiful sounds on Peiwoh, but it lacks the edge and musical development that I need. But if you like your Bach to come complete with Flower Remedies this is one for you. And while on the subject of taking the rough with the smooth I cannot overlook the letter recently received by a select few Snape concertgoers. I am, of course, a huge fan of Aldeburgh Music whose outstanding work features here so often. 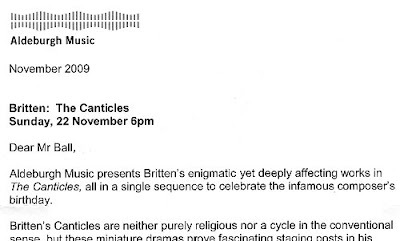 But I did chuckle at the opening sentence of this mailing shot for the performance of Britten's The Canticles on the composer's birthday. Hopefully just a glitch with the auto spell check. Or has someone at Snape been reading the newly published volume of the young Britten's diaries titled Journeying Boy? Find the answer by taking a peep inside the infamous composer's bedroom . Early in the life of this post one lesson is glaringly obvious. If you want site traffic mention a composer's bedroom.